Treasure the moment together this Valentine’s Day at Healey’s Bar & Terrace and enjoy a romantic evening with a lovers’ tapas platter and a bottle of wine. Pick a table in the stylish indoors section or enjoy the view of the stars and the surrounding lakes from the terrace. For more info call 043560600, email restaurantreservations@bonningtontower.com, or click here. Healey’s Bar & Terrace is a modern and stylish cocktail bar and the ideal venue to relax and unwind with friends after a long day’s work. Enjoy a masterly mixed cocktail or a fine glass of wine. 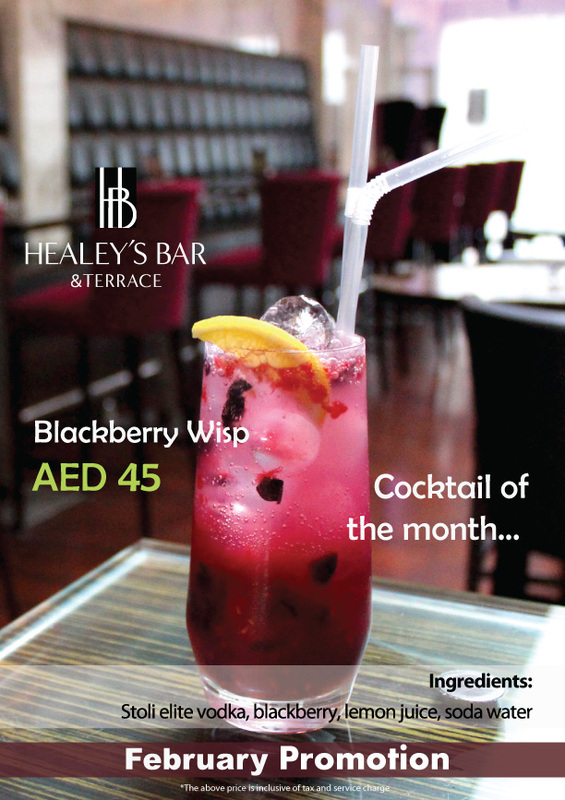 During the balmy autumn and winter months, experience Healey’s Terrace – an open-air terrace which overlooks the Almas Tower and surrounding lakes. With expertly mixed music the terrace provides a chilled out atmosphere making it the perfect place for a sunset cooler and some light snacks to welcome the evening! As always, you can find out more on our homepage! Have you seen our YouTube channel already? Leap into February with the Bonnington! Are you ready for February? We are and a very special February it’ll be, too! You’ve got an extra day to try out all our promotions and offers. Oh, and Valentine’s Day is coming, too! If you’re in the mood for romance, don’t forget about our Valentine’s early bird offer, which runs until 10th February. Book your gourmet Valentine’s experience at our Cavendish Restaurant & Terrace before the 10th and you save AED 100, because we’ll give you 5 courses for the price of 3 courses. Find out more about the offer here. Just in case you don’t really care about Valentine’s Day, check out what our friends in McGettigan’s JLT are organising: The guys & dolls anti-Valentine’s brunch. Find out more here. We’ve also got great food promotions in our Cavendish Restaurant & Terrace, on our Leisure Deck, and in the Authors’ Lounge. You can find them all on our dedicated Pinterest board here or or on Google here. Calling all romantic early birds! Valentine’s Day at the Cavendish & Healey’s! Pssst! Valentine’s Day is less than a month away! 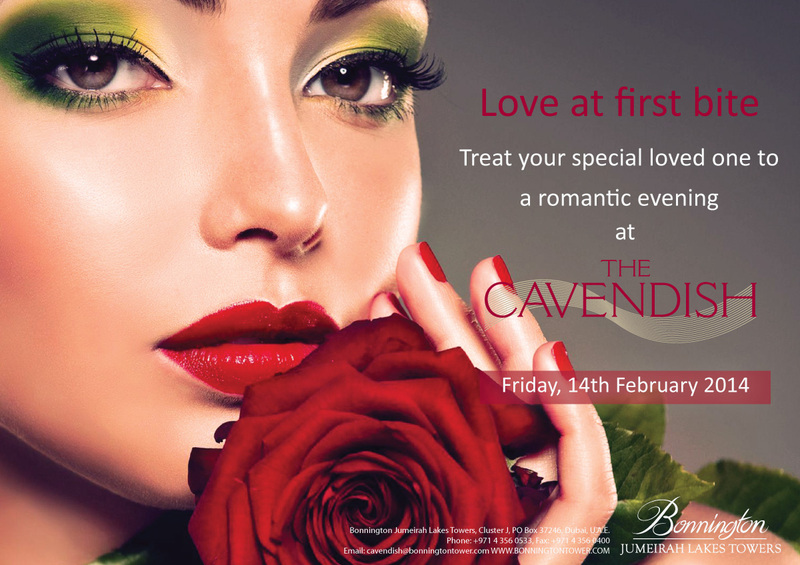 This Valentine’s Day, say it with dinner and enjoy a romantic & sumptuous gourmet meal in the elegant and cosy atmosphere of our Cavendish Restaurant. Even better: Book before 10th February and get 5 courses for the price of 3! How’s that for an early bird offer? You can chose from a 3 course gourmet meal for AED 399 or 5 courses for only AED 499 – both include a half bottle of French bubbly for you to enjoy with our compliments. 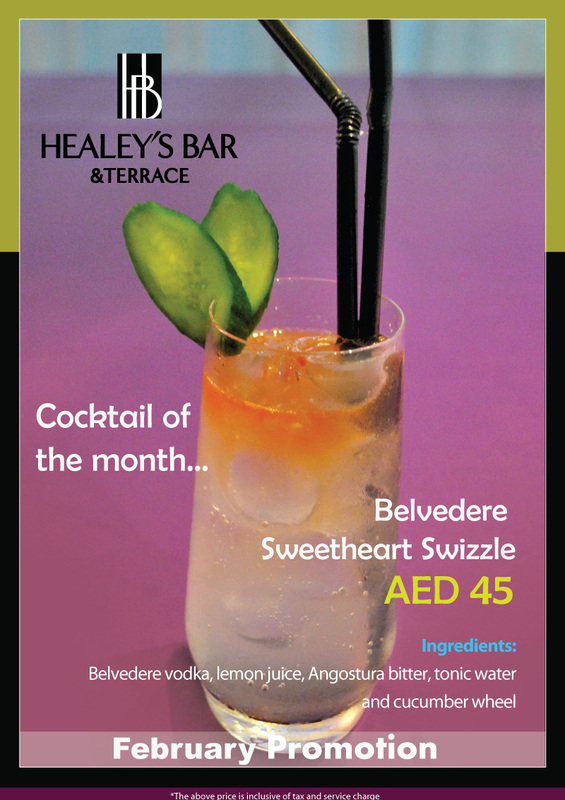 Later you and your loved one are invited to enjoy a delicious cocktail at Healey’s Terrace with our compliments. It is certainly the perfect way to begin or complete this special day. There’s also a lucky draw and one lucky couple will win a 1 night stay with breakfast at the Bonnington! Welcome to the Month of Romance. And of other special offers! #guestcommentwednesday , too! February is here and Valentine’s Day is looming on the not so far away horizon. 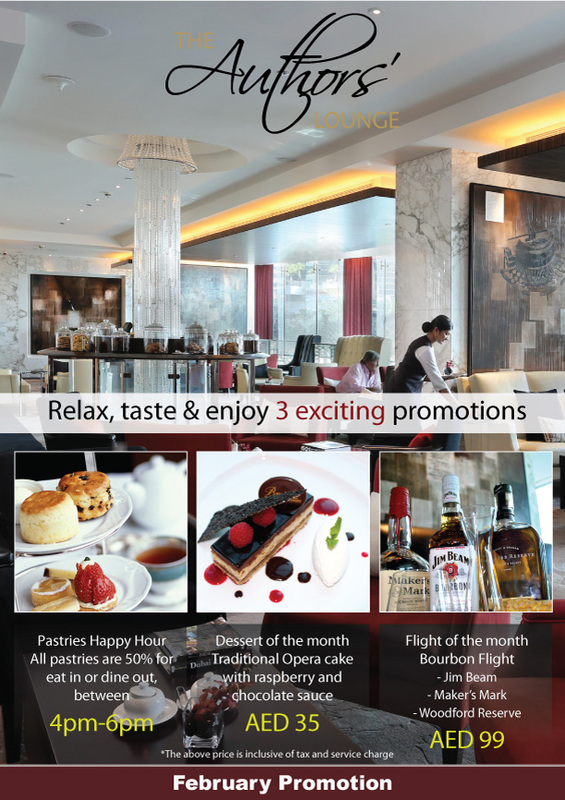 If you haven’t finalised your plans yet, click on the image above and check out our gourmet offers in the Cavendish Restaurant. If you’re not a fan of Valentine’s, why not give the annual anti-Valentine’s party in our McGettigan’s JLT a try? You can find out more about it on their blog here. Or, if you’d rather enjoy the cool weather outdoors, why not check out our Leisure Deck? Valentine’s Day is coming. Make it the yummiest yet! Valentine’s Day is getting closer. This year, forget about last-minute arrangements in average and over-priced restaurants in areas where you’re likely to get stuck in traffic and come to The Cavendish for your yummiest Valentine’s yet! It’ll be love at first bite for you and your loved one. Tuck into duck, venison, barramundi, and sample creative starters and elaborate desserts. All for just AED 369, per person, for five courses, or AED 299, per person, for three courses. Even better? Every course comes with its own glass of expertly paired fine wine. 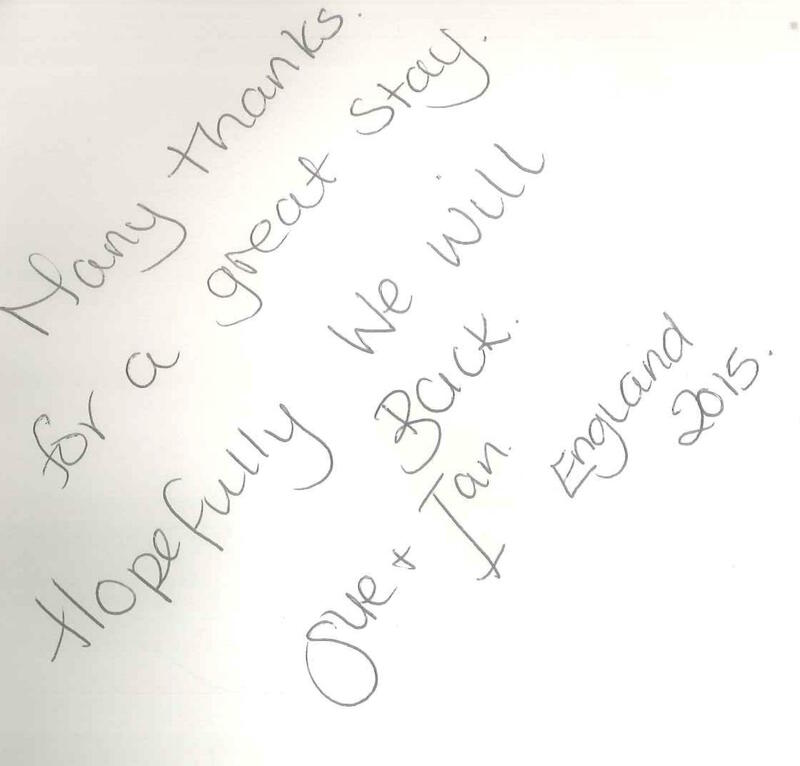 Add to that the impeccable Cavendish service and you’ve got a winning evening. Let us do the cooking, serving, and washing up, so you can focus on your loved one! You can book a table online, or you can email us at cavendish[at]bonningtontower.com. Getting here is hassle free with easy access from Sheikh Zayed Road and free valet parking. Or why not leave the car at home & take the metro and the tram? It’s an easy walk to the nearest station from here. What’s happening at the Bonnington in February? Check out our listing on their website here, or find out more about the event on their Facebook page here.